S&P/Case-Shiller is reporting what I have been posting for a while - that property values in the San Diego area peaked around fall of last year and have been in decline since. As we get further into 2011, the decline will be more apparent, even if property values stay steady on a month-to-month basis because they were increasing last year through to the fall in many places. A better indicator of our market performance may be short term comparisons. The S&P/Case-Shiller graphic below ends at the start of 2011. 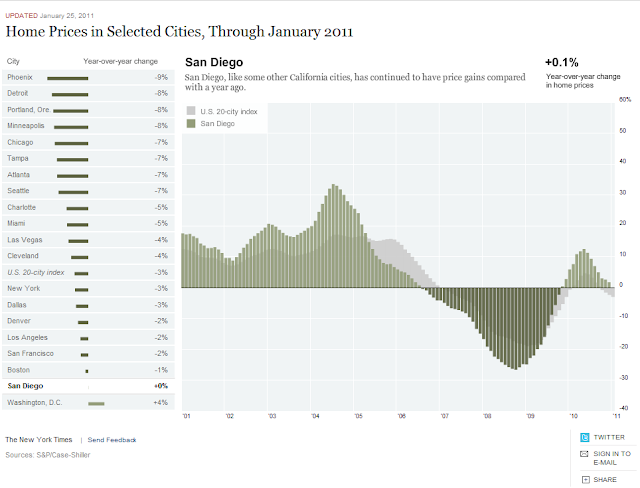 From my own statistical compilations I can report that property values continued to decrease in most markets. All of this having been said - San Diego, CA remains what of the best areas to buy a home based on its property values performance over the past year. Click on the graphic below to be taken to a Flash/interactive version of the chart.